Welcome! Travel by coach from Anchorage to Whittier as our experienced driver guide points out the sights along Turnagain Arm and the scenic Seward Highway. Spend the day retracing the routes early explorers traveled during the Harriman Expedition. Your 5-hour glacier cruise will cover 140 miles of narrow fjords, calm passages and stunning scenery. After the cruise, board the coach for the return trip to Anchorage. 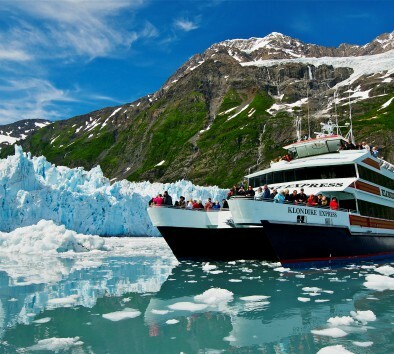 GLACIERS: From your catamaran, you’ll come face to face with towering masses of ice, so close you can hear glaciers move while gazing upon their brilliant blue hues and towering spires. You will see different types of glaciers, including Alpine (hanging), Piedmont (landlocked) and Tidewater (touching the sea). It’s not uncommon to see a glacier calve – where pieces of ice break off into the water. To witness this massive movement of ice and hear its thunderous roar is truly an unforgettable experience. WILDLIFE: Yet, with the bounty of glacial wonders, it’s not just about the ice. The wildlife is equally astounding. Enjoy sightings of sea otters, harbor seals, Dall’s porpoise and Steller sea lions during the cruise. You may also spot whales – both humpback and orca – bears, mountain goats and bald eagles. We even stop at a bird rookery that is home to thousands of kittiwakes. INFORMATIVE: Professional narration about the geography, history, glaciers and wildlife is provided by U.S. Forest Service Rangers and the Captain. COMFORT: Cruise on the largest, fastest and most luxurious catamarans in Alaska with multiple decks with enclosed and heated seating areas. All decks have outdoor areas with plenty of room for everyone to get an up close view. Comfortable seating at tables are reserved. Large picture windows wrap around the vessel to provide panoramic views from every seat. USB Charging ports are available at each table. SERVICE: The bar offers Alaskan Ales, wine, spirits, light snacks, and a variety of gift shop items for purchase. US Dollars or credit cards are accepted. Seven restrooms, complimentary hot coffee, tea and ice water at self-serve stations are available throughout the cruise. A complimentary hot meal is provided for every guest. A vegetarian and gluten-free option is also available upon notice 24 hours prior. WHAT TO WEAR: The temperature by the glaciers can be quite crisp. For your comfort, we recommend dressing in layers with a fleece jacket, hats, gloves, sturdy rubber sole shoes and a wind/waterproof coat. Bring your camera, extra memory cards, and batteries – you’ll find an endless array of scenic vistas, curious wildlife and stunning glaciers to photograph. We have a limited supply of high-quality binoculars on board for rent for the day, or you are welcome to bring your own. FAMILIES: Children enjoy the Junior Ranger program hosted by the U.S. Forest Service. Tour departs from the Hotel Captain Cook. Passengers under the age of 18 must be accompanied by a parent or guardian. Dress in layers. Bring a camera, binoculars, fleece jacket, hat, gloves, sturdy rubber sole shoes and a wind/waterproof coat. Lunch is included and served on board the vessel. The boat is heated and restroom equipped. Wildlife sightings are likely but not guaranteed. Travel time is approximately 2½ each way.